On Wednesday night, we took you to a hockey game. There was a deal that we just could not pass up. What you both may not know is that for many years Mommy had season tickets for our local hockey team. I traveled near and far with my friends to watch and cheer on the team. I miss those days a lot, but am so happy to watch both of you experience hockey now. NHL, this was the first time that you remember being down by the ice to watch warm ups before the game. We did this when you were really little, but no doubt you do not recall that. 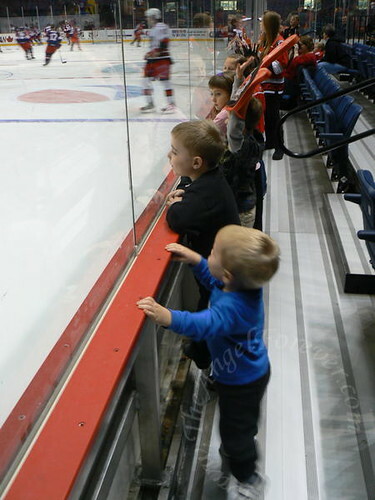 You got to see your friend down there and the three of you had a blast watching the team skate by, bang on the sideboards and toss pucks to some of the other kids. Then JSL was in his glory. He watched the entire post warm-up ice cleaning by the zamboni. According to Daddy you would not leave the area until it was completely finished. For each stoppage in play during the game you kept saying that the game was over. 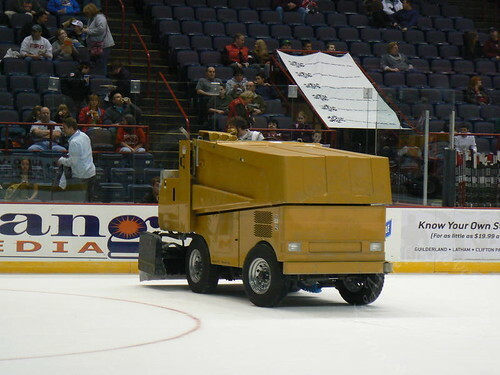 We finally realized it was because you wanted the zamboni to come back out. Between the periods JSL watched as the zamboni went round and round. He kept waving and his smiles got bigger and bigger each time it went by our end of the ice. NHL was funny because you were very concerned with the rough behavior of the players on the ice. Once you realized that penalties were being called you were ready to toss most of the players in there for anything. You will quickly learn that fighting is part of this sport and so is bumping each other on the boards. 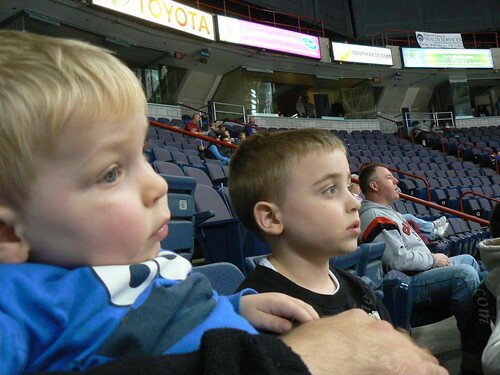 Hopefully we will get to more hockey games soon so you can both watch the hockey players and zamboni do their thing. One of the few dates (Oh the joy of single parenting)my husband and I went on was to a hockey game so the sport always makes me smile.